There are few entertainment franchises that mean as much to me as Kingdom Hearts. Square Enix and Disney’s bizarre-yet-delightful action-RPG series has held a special place in my heart (no pun intended) ever since my childhood best friend introduced me to it nearly 15 years ago. Now, after many years and several prequels, sequels and spin-offs spread across a multitude of platforms, Kingdom Hearts 3 has finally arrived. Therefore, to say I was excited for this game — the series’ first full-fledged console entry since 2005’s Kingdom Hearts 2 — would be a colossal understatement. Thankfully, after waiting nearly half my life for this game, I can safely say that Kingdom Hearts 3 — while not without its fair share of problems — is a largely satisfying and emotional conclusion to the sweeping tale that began way back in 2002. This time, the ever-effusive Sora (a returning Haley Joel Osment giving another great performance), alongside his friends Donald and Goofy, must unite the scattered Keyblade warriors to stop the villainous Master Xehanort and his Organization XIII from sending the world into darkness. That’s Kingdom Hearts 3‘s plot explained in the simplest way possible without diving into the franchise’s overwhelming amount of characters and their many doppelgängers, time-travelling counterparts and the like. Factor all of that in, though, and the story becomes egregiously overcomplicated, especially for a property featuring the likes of Mickey Mouse, Buzz Lightyear and Elsa. Unfortunately, this means that series newcomers will find it quite difficult to follow along, even after watching recap videos in the game’s main menu. Even longtime fans likely will, at times, struggle to keep track of all that is going on. Still, if you can look past the convolution and oftentimes hokey dialogue, you’ll find a surprisingly heartfelt story about enduring friendship. The central bonds between Sora and his friends are genuinely touching and lead to some particularly moving scenes, especially towards the end of the 30-hour adventure. For the most part, outside of the frustratingly vague and contrived epilogue and secret ending, Kingdom Hearts 3 manages to offer a fulfilling resolution to practically every character’s story. That said, getting to the grand finale will take a while. 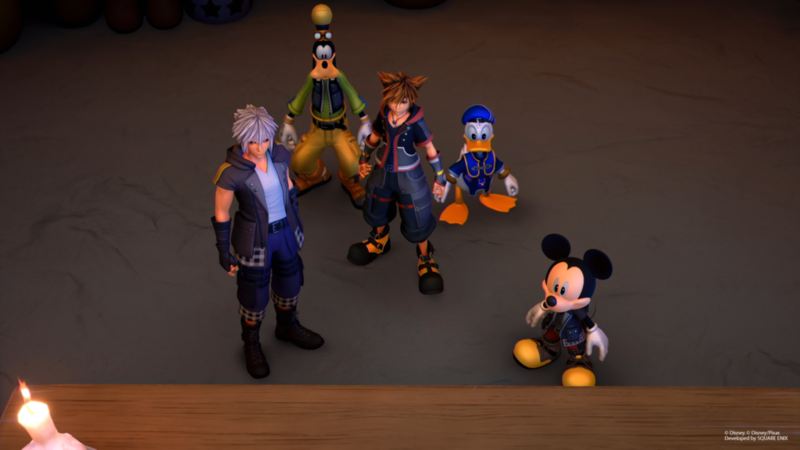 As in previous Kingdom Hearts games, Sora and friends will have to travel from various locales inspired by iconic Disney films in order to protect them from Organization XIII. That’s where Kingdom Hearts‘ tried-and-true hack-and-slash combat comes in, now more layered, engaging and awe-inspiring than ever. While Sora’s standard melee, magic and evasive maneuvers are back, Kingdom Hearts 3 truly shakes things up with the addition of Keyblade transformations. Previously, Sora’s weapons only offered stat boosts and the occasional support ability. Now, Sora can equip up to three at once and transform them mid-battle into much more powerful and unique versions after landing enough combos. For example, the early-game Hero’s Origin Keyblade from Olympus (Hercules) morphs into a shield which lets Sora block and absorb damage that he can then send back at enemies in a devastating parry. A subsequent transformation lets Sora ride a Pegasus-guided chariot and hurl lightning down on his foes. On the other hand, you might want to adopt a more ranged playstyle with Twilight Town’s Shooting Star Keyblade, which turns into a pair of blasters that can pepper foes from a distance. Bigger baddies, meanwhile, may require you to get up close and personal with the Toy Story-inspired Favorite Deputy, which can turn into a cartoonishly big mallet capable of causing huge amounts of damage. While some Keyblades have fairly similar powers, the majority of them feel marvellously useful and distinct. Further adding to the dynamism of battle is the Attraction Flow, a new summoning system which cleverly draws from famous Disney theme park rides. Having Sora, Donald and Goofy hop in a Grizzly River Run-inspired water raft ride or Big Thunder Mountain Railroad-esque coasters is both a great crowd control tactic and stunning spectacle to behold. 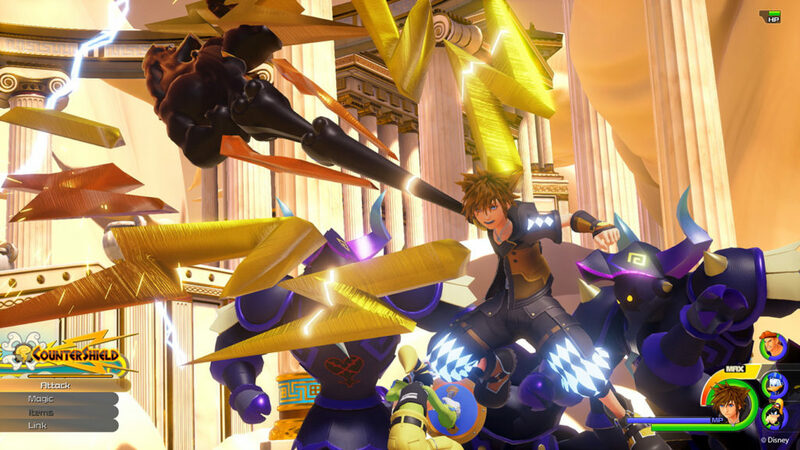 At the same time, Sora’s traditional method of summoning is back as well, letting you perform dazzling team-up attacks with Disney friends like Simba (The Lion King), Stitch (Lilo and Stitch) or, for the first time, Ralph (Wreck-It Ralph). 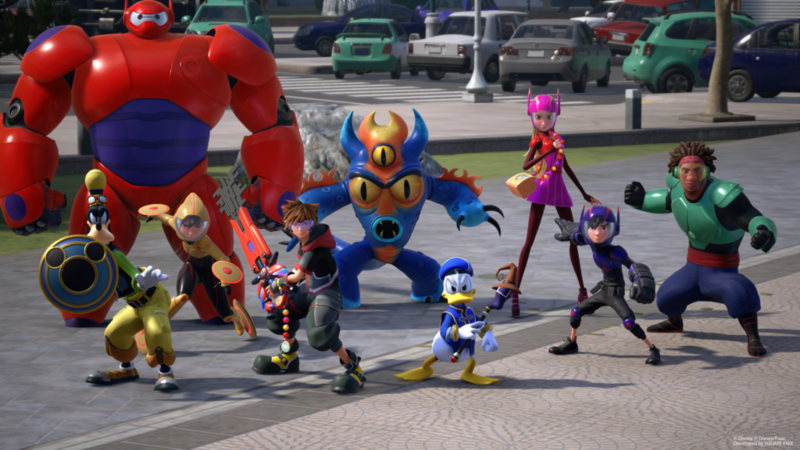 In addition to the revamped combat mechanics, Kingdom Hearts 3 features the series’ most diverse lineup of Disney characters to date thanks to the first-ever inclusion of Pixar. 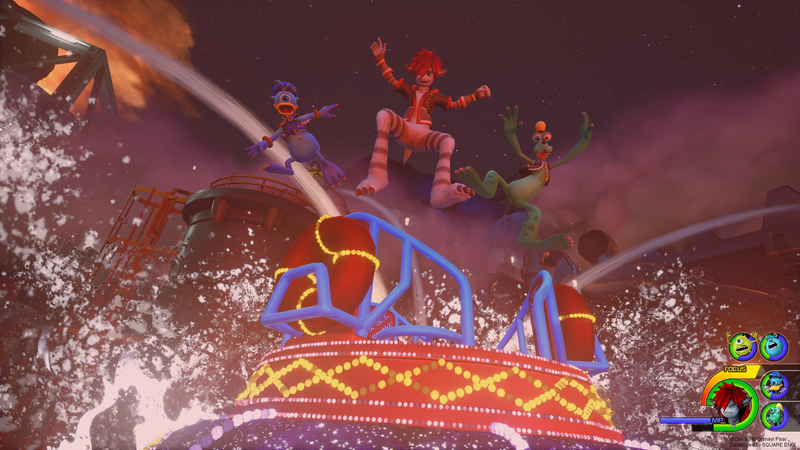 While the majority of the game’s worlds fall under Walt Disney Studios’ wing (Hercules‘ Olympus, Frozen‘s Arendelle, Big Hero 6‘s San Fransokyo, Tangled‘s Kingdom of Corona and Pirates of the Caribbean‘s the Caribbean), the two best stages are, incidentally, from Pixar — Toy Story‘s Toy Box and Monsters, Inc.‘s Monstropolis. That’s because these two worlds make the most out of the fantastic properties they’re based on. 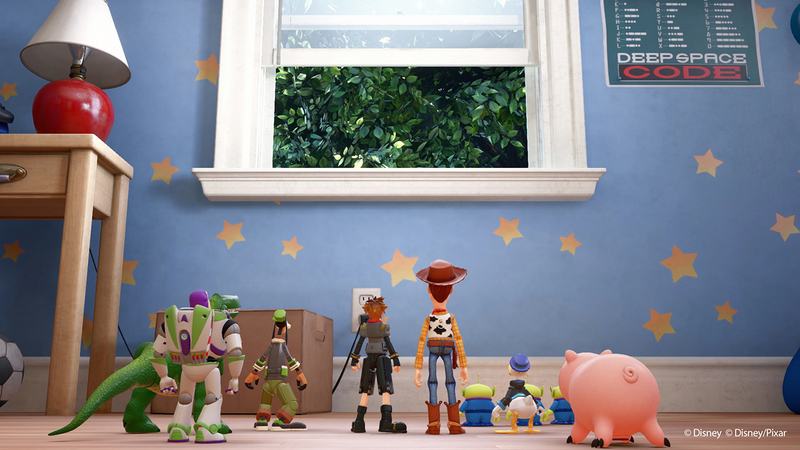 Toy Box is sure to be a dream come for those who, like me, have been dying for a Toy Story world in Kingdom Hearts all these years. I had a massive grin on my face as I explored the colourful and detailed multi-floor Galaxy Toys store with Buzz and Woody while a lovely rendition of Randy Newman’s “You’ve Got a Friend in Me” played in the background. 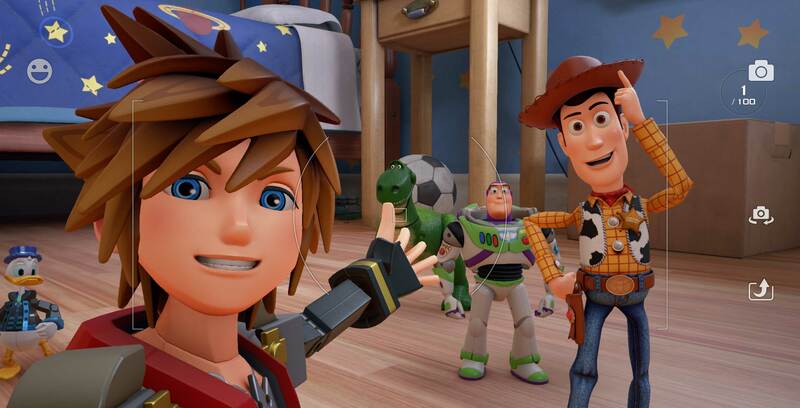 Moreover, by setting the game between Toy Story‘s second and third films, Square Enix has smartly woven Kingdom Hearts‘ larger themes of morality and friendship into Woody and Buzz’s struggles to find Andy. Likewise, Monstropolis takes place after the events of Monsters, Inc., allowing the developers to tell a simple but affecting story about Sora, Donald and Goofy helping Mike and Sulley bring the ever-adorable Boo home safely. At the same time, they’ll have to worry about the slippery Randall as he tries to take over Monsters, Inc. and turn the whole facility against them. 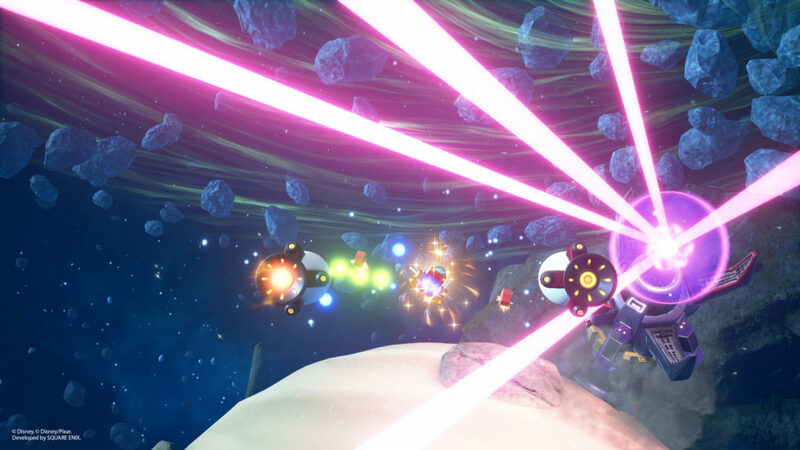 In contrast to the open playground feel of Toy Box, Monstropolis’ more focused sense of scope allows for the game’s tightest and most satisfying level design and pacing. With so much thought put into the narrative and gameplay of the Pixar worlds, it’s a shame that their Disney counterparts are more of a mixed bag. Olympus works quite well as a tutorial level, but the remaining four Disney worlds leave a bit to be desired. San Fransokyo’s post-Big Hero 6 story is certainly fascinating, with Sora and the gang helping Hiro and friends stop an invading threat and, eventually, a corrupted version of his brother Tadashi’s original Baymax model from the movie. 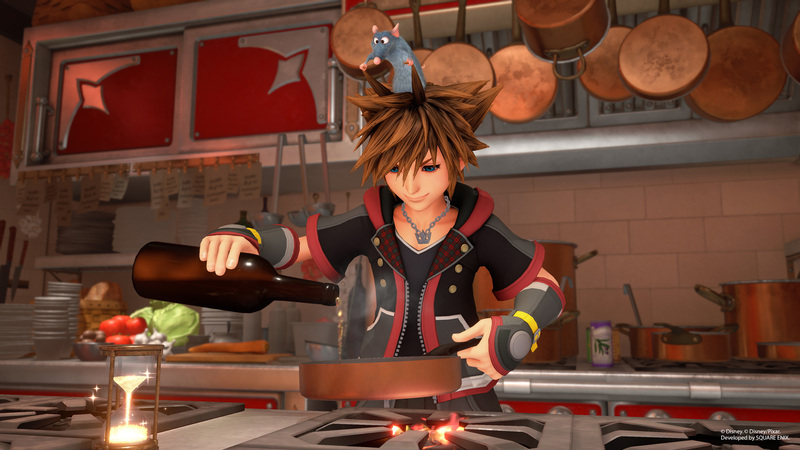 Unfortunately, the open city just doesn’t feature much to do outside of a few fun world-spanning side objectives, like scanning for hidden Mickey-shaped Lucky Emblems in the environment using Kingdom Hearts 3‘s brilliant photo mode or gathering ingredients to cook stat-increasing food with Ratatouille‘s Remy the rat. The dearth of optional content is even more of a problem in the Caribbean, despite its impressive Assassin’s Creed IV: Black Flag-lite pirate ship battle and exploration mechanics. To be sure, this is a welcome change in gameplay type during the story, but there’s little incentive to revisit the world and sail to the various miniature islands beyond those aforementioned collectibles. Still, there’s a lot to like about these areas, which is more than can be said for Corona and Arendelle. In addition to suffering from the above issues, these two worlds hew almost verbatim to the stories of their respective movies and feel like tired retreads as a result. Further, these worlds feature noticeably bland and repetitious environmental design, forcing you to constantly scale Arendelle’s seemingly never-ending snowy mountains or make long treks through Corona’s vast stretches of deep forest. What’s more, tying all of these worlds together is the somewhat underwhelming Gummi Ship, Sora’s returning mode of transport. The customizable ship can now be flown through mini explorable galaxies, although it still feels like a roadblock to the actual Disney worlds. It’s also worth noting that across all of Kingdom Hearts 3‘s worlds is a disappointing lack of any Final Fantasy characters, save for Kingdom Hearts‘ typical Moogle shopkeepers. Series co-creator and co-director Tetsuya Nomura said Kingdom Hearts 3 didn’t allow much space for Final Fantasy characters, but it still would have been nice to get a few cameos. Fortunately, what does remain consistent among all of Kingdom Hearts 3‘s worlds is uniformly excellent production value. The visuals are downright beautiful, neatly blending Square Enix’s stylish anime style with vibrant, lively Disney character models that truly feel right out of the movies they’re based on. It also doesn’t hurt that many of the talented original voice actors has been brought back, including Idina Menzel (Frozen‘s Elsa), Zachary Levi (Tangled‘s Flynn Rider), Tate Donovan (Hercules) and Scott Adsit (Baymax), in addition to convincing replacements like Tom Hanks’ brother Jim as Toy Story‘s Woody and Jared Butler as Pirates of the Caribbean‘s Jack Sparrow. Meanwhile, longtime Kingdom Hearts composer Yoko Shimomura returns alongside Takeharu Ishimoto and Tsuyoshi Sekito for some wonderful new pieces, in addition to some great remixes of her stellar music from earlier games. Kingdom Hearts 3 is far from perfect. The game’s overwrought lore makes it far more daunting than it should be, while uninspired design mars many of the worlds, particularly in the Frozen and Tangled areas. With all that said, Kingdom Hearts 3, perhaps more than any other game I’ve played, is just so joyful of an experience. Between the endearing interactions between Sora and his friends, the excellent combat and fantastic presentation and audio, Kingdom Hearts 3 is practically overflowing with charm. For now, we have no idea what the future holds for the series, especially as Nomura no doubt shifts over to the equally long-gestating Final Fantasy VII Remake. Wherever Kingdom Hearts goes from here, though, I’m just happy to have been along with Sora for the ride. Kingdom Hearts 3 is now available on PlayStation 4 and Xbox One.